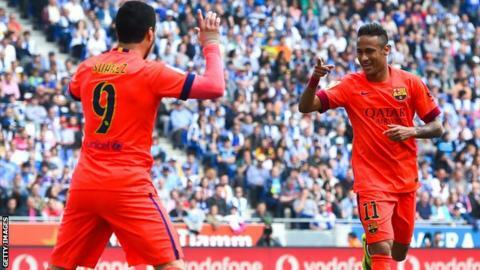 Barcelona increased their lead at the top of La Liga to five points with a derby victory over Espanyol. Neymar put Barca ahead with a well-worked goal before Lionel Messi added a second with a composed finish. Barca's Jordi Alba was given a red card for dissent in the 54th minute with Espanyol's Hector Moreno also sent off late on for the same offence. Second-placed Real Madrid will aim to reduce the gap to two points when they face Celta Vigo on Sunday. Playing on the first anniversary of the death of former coach Tito Vilanova, who died at the age of 45 after a long battle with cancer, Barcelona took their unbeaten run to 13 matches in all competitions. Neymar scored twice in the 2-0 victory over Paris St-Germain in the Champions League during the week to set up a semi-final against Bayern Munich. And the Brazil forward ensured the visitors' impressive start was rewarded with the opening goal at the Power8 Stadium after a slick passing move. Messi's ball from deep picked out Jordi Alba on the left flank and his cross was dummied by Luis Suarez for Neymar, who emphatically dispatched a low shot under Espanyol goalkeeper Kiko Casilla. Barcelona increased their advantage before half-time when Messi scored the 401st goal of his career. Suarez's cushioned pass to the back post was controlled by the Argentina international before he stroked the ball in from a tight angle. Barcelona were reduced to 10 men early in the second half when Alba was sent off after being aggrieved not to win a free-kick. The defender was booked for kicking the ball away and then received a second yellow for continuing his argument with the referee. Moreno was sent off for the home side in injury time when he received two bookings for dissent. Later on Saturday, Antoine Griezmann scored twice as champions Atletico Madrid, who are third in the table, beat Elche 3-0. Strugglers Levante beat Getafe 1-0 with Victor scoring the only goal and David Moyes's Real Sociedad drew 0-0 with Villarreal. Match ends, Espanyol 0, Barcelona 2. Second Half ends, Espanyol 0, Barcelona 2. Attempt blocked. Salva Sevilla (Espanyol) right footed shot from outside the box is blocked. Rubén Duarte (Espanyol) wins a free kick in the attacking half. Second yellow card to Héctor Moreno (Espanyol). Héctor Moreno (Espanyol) is shown the yellow card. Rubén Duarte (Espanyol) wins a free kick on the left wing. Substitution, Barcelona. Xavi replaces Andrés Iniesta. Attempt saved. Christian Stuani (Espanyol) left footed shot from the centre of the box is saved in the centre of the goal. Assisted by Paco Montañés with a through ball. Lucas Vázquez (Espanyol) wins a free kick in the defensive half. José Cañas (Espanyol) is shown the yellow card for a bad foul. Foul by José Cañas (Espanyol). Substitution, Barcelona. Ivan Rakitic replaces Luis Suárez. Claudio Bravo (Barcelona) wins a free kick in the defensive half. Foul by Héctor Moreno (Espanyol). Corner, Espanyol. Conceded by Claudio Bravo. Attempt missed. Neymar (Barcelona) right footed shot from a difficult angle on the right is high and wide to the right. Attempt blocked. Lionel Messi (Barcelona) left footed shot from the centre of the box is blocked. Assisted by Neymar with a through ball. Hand ball by Luis Suárez (Barcelona). Attempt missed. Christian Stuani (Espanyol) left footed shot from the centre of the box is too high. Assisted by Lucas Vázquez. Substitution, Espanyol. Paco Montañés replaces Víctor Álvarez. Lucas Vázquez (Espanyol) is shown the yellow card. Lucas Vázquez (Espanyol) has gone down, but that's a dive. Substitution, Espanyol. Christian Stuani replaces Felipe Caicedo. Andrés Iniesta (Barcelona) wins a free kick in the defensive half. Foul by Lucas Vázquez (Espanyol). Attempt saved. Sergio García (Espanyol) left footed shot from the centre of the box is saved in the centre of the goal. Assisted by Víctor Álvarez with a headed pass.